In the spring I did season-by-season recaps of the three old years added to the fold: 2003-04, 2004-05 and 2005-06. I liked those so much that I've decided to do them for every single year of the decade across which A18-49+ era is available. The summer began with 2012-13, last time we looped back to 2006-07, and today... it's 2007-08. In November 2007, the Writers Guild of America writers went on strike, halting production on nearly every primetime scripted show. Almost nothing scripted produced a full season. Though this seemed quite likely well ahead of time, the networks pretty much programmed the fall as if there wouldn't be a strike, so most shows had run out of episodes at the end of the fall or maybe a few weeks into 2008. The strike wasn't resolved till February, and so the new episodes didn't start trickling back in until about mid-March. And that was mostly just some quick-turnaround multicamera comedies; most dramas didn't return till around mid-April, and quite a few shows didn't even return until the next season. This created a prolonged dead time in the middle of the primetime season. It was almost like a second summer, and several networks programmed it that way. The effects of this shutdown were felt in almost all of the big picture metrics examined in this post. The network best poised to take advantage of this was certainly Fox, whose juggernaut American Idol (319/299) wasn't affected by the goings on. And plenty of other unscripted successes emerged on Fox, fueling likely their strongest relative season ever: fall newbie Kitchen Nightmares (89), an in-season, post-Idol edition of Hell's Kitchen (142), breakout game show The Moment of Truth (174) and the respectable Thursday game show tandem of Are You Smarter Than a 5th Grader? (77) and Don't Forget the Lyrics (81). However, the strike was not without its effects even on Fox. Namely, they had to shut down House (215), one of the hottest shows on TV in late 2007 in posting its best fall ever. Fox rewarded it with a post-Super Bowl berth, but the show awkwardly had just two other episodes coming into 2008. It aired an episode on 1/29/08, a post-SB episode five days later, another ep two days after that, and then it vanished for nearly three months. ABC finished second in entertainment average, but it saw much of its momentum halt. Their megahits Grey's Anatomy (218) and Desperate Housewives (205), like House, came back from the strike much weaker than they'd been before. The once promising all-newbie Wednesday lineup, led by Private Practice (128) and Pushing Daisies (98), was done by early December and didn't go back into production. The shows were never the same when they returned the next fall. Because many of their scripted shows in this serialized drama-heavy period didn't repeat well, ABC had to air a ton of filler: Wife Swap (69), Supernanny (84), Dancing with the Stars spin-off Dance War (80), and prank show Just for Laughs (41). NBC, like Fox, was less reliant on a scripted framework (mostly because they didn't really have one), so they held on a little better than ABC and CBS. Most egregious was the whooping 75 in-season hours of Deal or No Deal (85), but other unscripted offerings like newbies American Gladiators (128) and Celebrity Apprentice (108) posted legitimately nice ratings. CBS had its worst season in the A18-49+ era as they mostly just resorted to their traditional summer strategy: air Big Brother, and otherwise pretty much just turn off the lights. It was one of the Big Brother franchise's weakest seasons (70/65/71). However, though this was a low point for the network, they ended up recovering from the strike's effects better than almost everyone. Their Monday comedy lineup went back into originals nearly a month before most scripted offerings, and Two and a Half Men (151) and How I Met Your Mother (107) turned that into momentum they would build upon in the future. 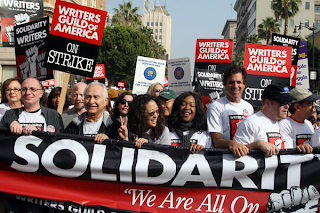 The WGA strike has an interesting effect on these numbers. While it was a weak year in terms of solid/hit shows, the shortened seasons for big scripted hits (and a lot of reality junk filling in) lowered the entertainment average, meaning a relatively low percentage of outright flops. The strike chaos also probably got a lot of shows renewed that wouldn't have been with a full season. A staggering seven of the 10 renewals went only one more season. However, slow starter but eventual megahit The Big Bang Theory almost singlehandedly lifts this class above some others. Chuck somehow eked out five seasons, and Private Practice made it six, but in the end there was very little long-term impact outside of TBBT. Of the five years of relative network stagnation (2006-11), this one had the most movement, mostly due to strike-related deflations. In addition to the aforementioned ABC and CBS, the CW was also a heavily scripted-reliant network, and it took its own significant step down. For Fox, it was their strongest year in the A18-49+ era (and if I had the numbers, I'd guess almost certainly their strongest year in network history), while NBC had the best year of its seven-year dead time from 2005-12. Tuesday took over as the strongest day of the week in 2007-08, becoming the third day in as many years to top the chart. To a large extent, they simply backed into this, because Tuesday with its full-strength American Idol was not as filled with scripted programming as previous champ Thursday. Tuesday would hold the day crown for the next two seasons before taking a huge descent after American Idol left. The 10:00 hour fell big yet again in this season, though some of that was because the 10:00 hour is the most reliant on scripted programs. (In other words, it has the least reality.) It would rebound a bit in 2008-09, but not much, and would drop back below this number in subsequent seasons. *- I don't have the half-hour breakdowns entered for 2006-07 thru 2009-10, so for now I will break these seasons down by hour rather than by half-hour. They'll probably be a bit off, since two-hour telecasts won't be broken out exactly right, but they're close enough to get a good general idea by hour. I've noted before that the percentages of real estate for originals and reruns have stayed surprisingly steady over the years. By that standard, this season's shortened scripted seasons made an impact. The 61% originals were the lowest in the A18-49+ era (the other seasons fall from 62% to 66%), while the 23% reruns was tied for the most. But that's not a very big difference considering most scripted seasons were shortened by about a third. Most of that original deficit was made up with filler. I was genuinely surprised that the networks scheduled their scripted shows as they did in this season. Sprinkling in new episodes here and there between November and March wouldn't have been great, but I half-expected either ABC, CBS, or The CW to take the hit during November sweeps with reruns and hold new episodes for February to have the landscape for themselves. ABC lucked out in having Lost in its back pocket since the 3-season wrap-up was already announced. It definitely kept them on the Thursday map, and I imagine it became a more profitable show as advertisers probably flocked to it. The biggest winner of the strike was How I Met Your Mother, by far, as it stopped being a perpetual bubble show and gained enough strength to finally be a 8:00 p.m. anchor. I wonder if the strike is partly a reason why the class of 2006-2007 is extinct. The shows in that class (Brothers & Sisters, Ugly Betty, Shark, etc.) didn't have a solid fanbase yet like Grey's Anatomy or Desperate Housewives while the freshmen shows in this season were able to launch again as a kind of second-chance. The exception to this rule should have been Heroes, but that flamed out too. I definitely wouldn't have picked Rules of Engagement and 30 Rock to live the longest from that year. Interesting theory about the sophomores of this year. I think you are probably on to something. Then again, last year's class was largely successful and while I like it or not, most of them were big let downs this year ratings wise (Revenge, OUAT, New Girl, 2 Broke Girls, Suburgatory and, to a lower extent, POI and Grimm) and there is no strike to justify it. Hard to say, really. I half-expected either ABC, CBS, or The CW to take the hit during November sweeps with reruns and hold new episodes for February to have the landscape for themselves. Or even gone all-in on the assumption that there'd only be 13-episode seasons and done the Friends final season scheduling - originals in sweeps, reruns essentially every other week. If the strike went on long enough, that could have allowed them to dominate *two* sweeps, without taking a real hit in the other one! I wonder - would DoND have been a Millionaire-esque flameout were there no strike? Granted, NBC's scripted lineup was almost as bad as it is now, so they could still have plausibly given it the Millionaire treatment, especially as it was a show that arguably warranted it. But the format's worked with more sparing treatment elsewhere - the Dutch original version (granted, with a massive quiz front game that changes every few seasons) airs two short runs a year, one leading up to Christmas and the other in the spring, and is still going after about fifteen years (of which eleven have featured the DoND endgame). I'm half-surprised that nobody's tried doing something similar in the US by scheduling a big unscripted show to run purely in November and May as an event - at the least, I think ABC could have managed a few more years out of Millionaire that way. Could NBC have made DoND a similar event? For that matter, could ABC, who piloted DoND (quiz game and all) in the pre-DH/Lost/Grey's year of February 2004? Friends, not to mention the ratings landscape, was a different kind of beast then. NBC was able to parcel the 18 episodes out to cover the beginning of the season and sweeps because multi-camera sitcoms rerun incredibly well; ABC by contrast would not have been able to get away with that with their serialized dramas. I think Deal or No Deal would have flamed out regardless, but the strike certainly sped it up. Even without a strike, NBC would have had to really fight temptation to not use DoND for patching scheduling holes like ABC did with Millionaire. The networks are dipping their toes in the event-scheduled reality show like you are suggesting (The Sing-Off, Take it All, Extreme Makeover: Home Edition's reboot), but during lower-stakes times (i.e. December). Yes, the December stripped launch seems to be the approach now (and, again, DoND started that). NBC are trying another option for event-scheduling this year with Million Second Quiz - the two weeks before official premiere week in September. That'll be interesting, especially as NBC get the jump on the other networks with SNF in those weeks.